In 2011, Foster the People came out with their debut album, “Torches.” Although “Pumped up Kicks,” a song about a high school shooter, became the ironic anthem of the summer, the rest of the pessimistic electronic album was not lost to the music community. 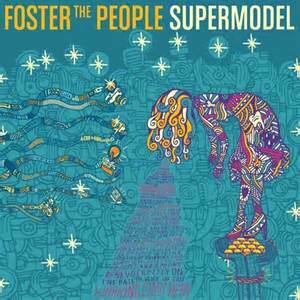 Foster the People has followed their upbeat and secretively dark dreamland of “Torches” with “Supermodel.” By layering acoustic and rock elements with world instruments and electronic sounds, Foster the People achieves a different kind of recycled sound, deviating from the genre they helped create. The album flows in a zigzag sequence between songs that evoke parallels with “Torches” and tracks that deviate into psychedelic, rock and even acoustic genres surrounded by the foggy dream state that Foster’s voice evokes naturally. “Ask Yourself” has the acoustic soft accusation as it twists the American dream, “You say that dreamers always get what they desire/ But I’ve found the more I want the less I’ve got.” “Nevermind” showcases subtle xylophones that hide behind the hum of the guitar and punchy vocals. If “Supermodel” starts in a lucid dreamland of imperative thoughts, “Pseudologica Fantastica” and the tracks that follow shift into the act of waking up with questions. The ‘80s space ballads emerge in “The Truth.” “A Beginners Guide to Destroying the Moon” is a rock song that commands all attention. The transient electric energy that pulses through songs like “Nevermind,” “Best Friend” and “Goats and Trees” plays to elements of other great artists: guitar solo sounds like MGMT, Jimi Hendrix, the Artic Monkeys and Jack White; vocals reminiscent of the Strokes and U2; acoustic play like Donovon; and composition that flirts with both the Beatles and Queen. The mélange of all of these influences and feelings initially sounds cluttered. Although “Supermodel” is definitely not easy listening, there is an ever-present line connecting it all. The multiple genres are linked by the motif of American consumerism, and the sick chaos infecting our assumptions about happiness. Foster the People’s unique sound and image is, frankly, an amalgamation of songs, which have been written before; that album’s value and individuality stem from the inky and poignant synthesis of these elements of music into new meaning.